Cincinnati Babyhead reminded me of this outstanding album. I was so into Pat Metheny in 1981 when As Falls Wichita, So Falls Wichita Falls came out, that if Pat had farted on an LP I would have bought it and liked it. This album was a winner. A departure from the lite jazz albums he had been making with the Pat Metheny Group (PMG) and the straight ahead jazz of 80/81. Metheny had hinted at this new direction on the acoustic, solo/overdub masterpiece New Chautauqua (an album that is not appropriately appreciated in the Metheny catalog – but that is another blog post). 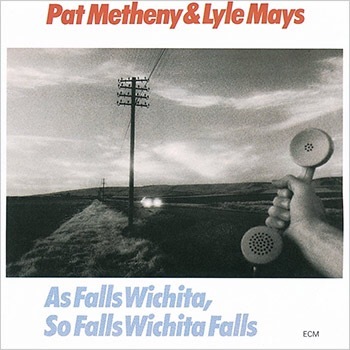 As Falls Wichita, So Falls Wichita Falls is a much more composition/orchestration focused album than anything Metheny and Mays had ever done before. It foreshadows the beautifully complex composer/arranger/orchestrator Metheny would become in the Geffen/Warner Brother/Nonesuch years with compositional peaks like The Way Up. I loved the mellow vibe of the first Group album (it is firmly in my top 100 albums). Ignore my lite-jazz classification above – lite-jazz does not necessarily mean bad jazz – there are some notable exceptions. I also love its follow-up, American Garage. After those two albums, I was ready for something a little more “out there” and As Falls Wichita, So Falls Wichita Falls delivered. As Falls Wichita, So Falls Wichita Falls trimmed the Group down to Metheny (guitars) and Lyle Mays (keys). They added some spice with Nana Vasconcelos on percussion. And you can’t beat ECM producer Manfred Eicher (although I bet he let the boys have pretty free rain in the studio for this one). I saw the full Pat Metheny Group that toured in support of this album on Halloween night 1981. They played most of this album, which very much lent itself to a spooky Halloween presentation (I remember the light show was particularly spectacular). It was one of the best concerts I have ever witnessed. So rediscovering this album is kind of sentimental. I will admit this album was not “lost on my shelves,” but it has been a good five years since I gave it a “front and center” listen (it is a great background music album in that it plays well at low volume). Side one is the twenty-minute titular track. It almost has an ambient feel, but it is not repetitive. It is a long atmospheric suite. Metheny and Mays explore sounds: keyboard washes, ambient noise, rumbling bass, keyboard and guitar riffs, percussion, crescendos, etc. This is all presented in a dramatic fashion. It has a spacey Pink Floyd feel. This is the song that lent itself to a spooky presentation that Halloween night in 1981. Side two is made up of four shorter songs. “Ozark” open the side. It is a jangly acoustic number that would not have been out-of-place on New Chautauqua except for Mays’ grand piano. “September Fifteenth” (a special day in my life, but this song is in honor of the death of pianist Bill Evans who passed on 9/15/80 during the recording of this album) is a quiet contemplative number with Metheny gently playing his guitar over Mays’ keyboards. It then becomes a complex duet between guitar and piano, yet it remains contemplative. “It’s For You” is the pure early PMG sound. It would not have been out-of-place on this first two PMG albums. It does introduce ambient vocals that would later become a big part of the PMG sound. The final cut on the album is “Estupenda Graça.” It is a short meditation that quietly ends the album. It includes a wordless vocal that has a yearning feel. In hindsight the album is not nearly as “out there” as it felt in 1981. But a lot of that has to do with how Metheny has extended the concepts of this album for the last 35 years. This album was a prototype for the rest of Metheny’s career. At the time when this album was released, it seemed like a complex beast, now seems like a simple beauty. If it’s further out than ‘X’, it’s probably not for me. I think the real guy is someone who digs mellow light jazz to the avant-garde and everything in between. He has enough money he can do whatever he wants. I think he is a true musical explorer. Sign of 4 is pretty unlistenable. But I appreciate his desire to do stuff like it. I am not interested, but it is cool he is. I notice from his website he’s touring Europe this year. Don’t see any other gigs. It also mentions his most recent album was a 2016 effort called ‘The Unity Sessions.’ I might want to dip into that a little bit. I have seen the Unity Group and it is a great straight ahead jazz. The sax player is fantastic. Recommend that album. You made up my mind for me on what to listen to on my walk today. Just listening to a little Bill Frisell ‘Where In the World’ as I sit in front of the box here.